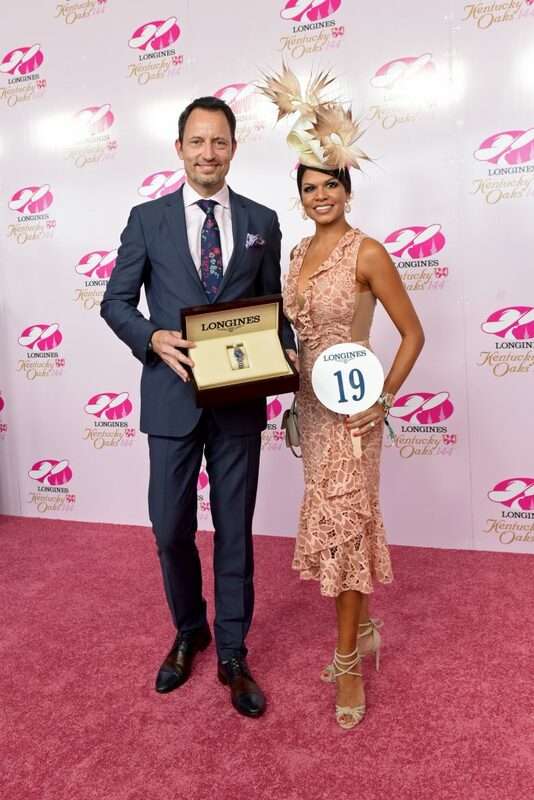 This past weekend I had the wonderful fortune of being invited by Longines to the famed Kentucky Derby. 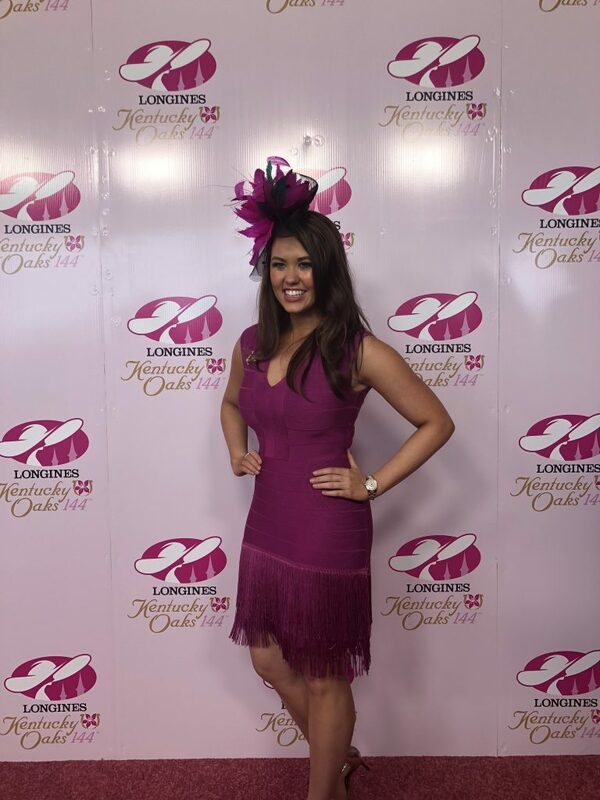 In the middle of America – Louisville, Kentucky, to be exact – I would get to sport grand fascinators and hats, drink mint juleps (the official cocktail of the Derby) made with Woodford Reserve bourbon (one of my favorites), and wear a Longines Conquest V.H. P. watch for a couple of days. I would get to hobnob with celebrities that included Miss America, Aaron Rodgers and his Packers football teammates, Anthony Anderson and others, and to sample cuisine by renowned chefs as I relaxed between races in the six-story “Mansion” at Churchill Downs — where Longines reserved a portion of one of the six floors as its luxurious and comfortable home base. Naturally, I jumped at the invitation and am glad I did because it was everything I expected and more. First of all, Churchill Downs is huge. Think of a football stadium… and then think of three football stadiums put together … the space is expansive. The grounds include the original construction with the famed twin Spires atop the equally as famed original jockey club and the forbidden Speakeasy, several newer buildings including one just finished a week before the Derby that houses hundreds of private suites for viewing the races, as well as hundreds of tables in windowed rooms throughout the three-story building. The famous twin spires of Churchill Downs served as a beacon for early derby goers in the late 1800s. And then there is the Mansion– a six-story building that has a different decor and theme on each level. One floor of this building plays home to the TurfClub — where most of the celebrities hang out. The top floor is reserved for guests of the main Derby sponsors and partners. Created with a trackside view and a huge balcony, this floor resembles a true mansion living room, complete with fine progressive dining all day long and a huge bar where, of course, Woodford Reserve is served non stop from morning until night. 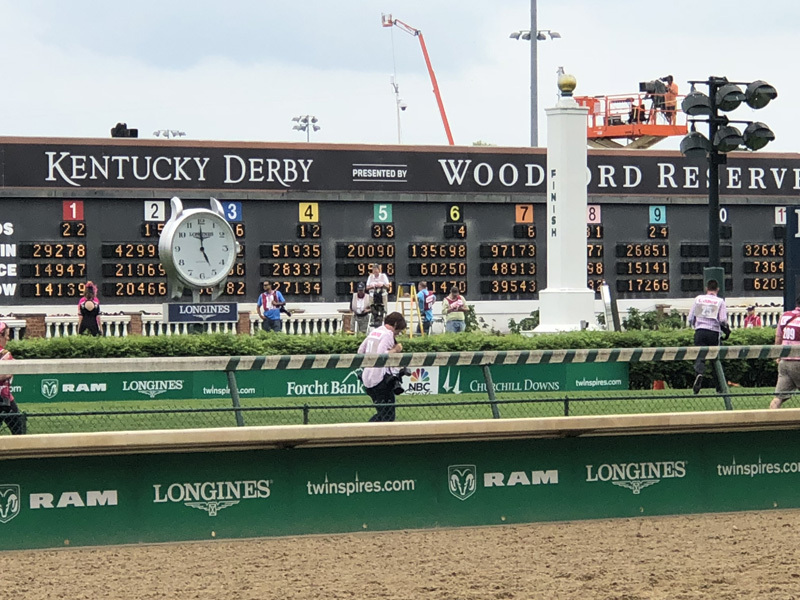 The full name of the Run for the Roses is actually the Kentucky Derby Presented by Woodford Reserve, and the official drink of the Derby is the Mint Julep– made with bourbon and fresh sprigs of mint (farmed locally) and Woodford Reserve (see recipe below). There is also a Spires drink that is pretty refreshing and is made with bourbon, cranberry juice and citrus. Yes, I sampled each of these drinks (more than once). 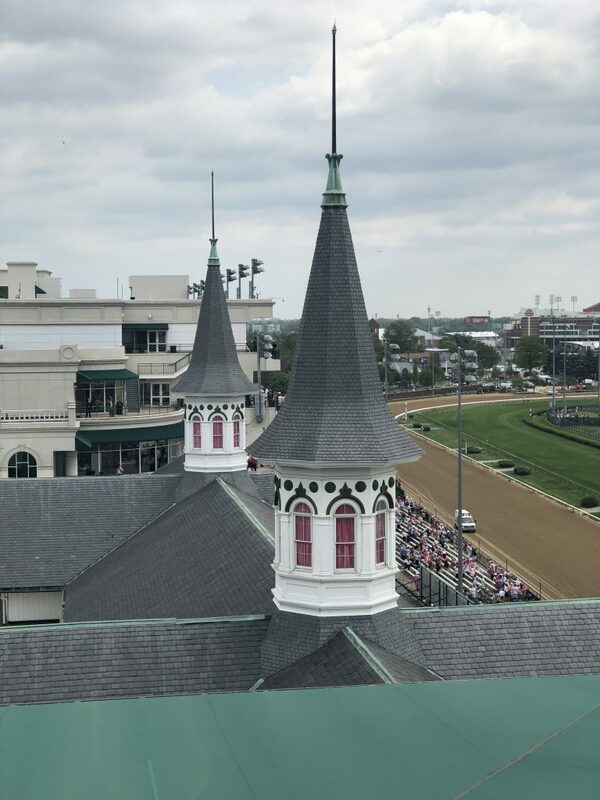 The 144th Kentucky Derby was run at Churchill Downs in Louisville Kentucky on May 5, 2018. Outside of the these buildings, the grounds range from the famed Millionaire’s Row — where all of the owners sit outside to watch the races — to the paddocks, where the horses are brought before the races, the barns where the horses are groomed and cared for with incredible love and adoration, and the fair grounds — complete with food stands, alcohol stands, gift shops and more. In fact, the entire weekend is a huge festival (this year nearly 160,000 people attended the event) where just about $200 million is bet on the ponies, where hundreds of thousands of dollars are spent on food and drink (a Mint Julep on the fairgrounds costs about $11, and the very special limited edition Woodford Reserve mint bourbon sells for $1,000 a glass — until it is sold out) and where fashion and hats are all the rage. 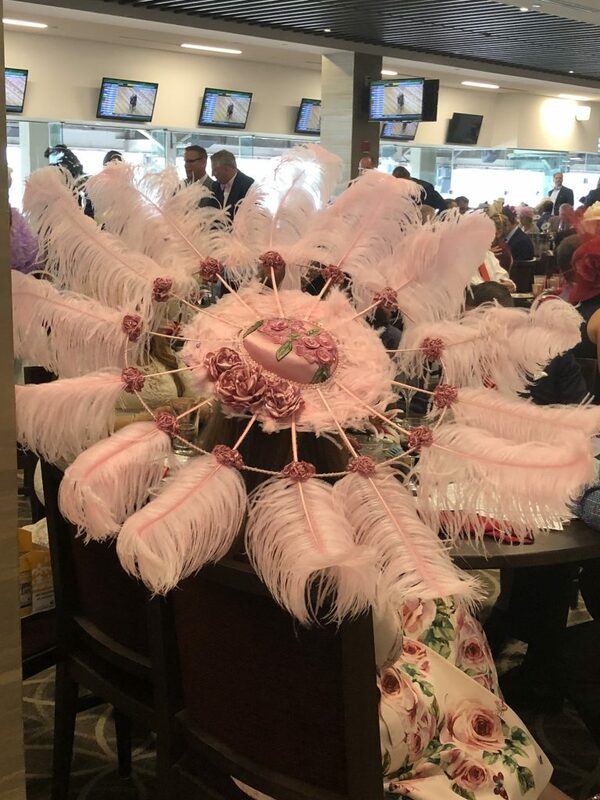 Hats at the Kentucky Derby: the bigger, the better. Famed around the world for the style and fashion, the Kentucky Derby — also known as the “fastest two minutes in sports” — may be the only outdoor sporting event where women wear dresses and huge hats or fascinators (a smaller but fancy bow, feathers, plume or cap attached to the head via a clip or a headband), and men dress in dapper style. This year’s Derby day was wrought with rain — sometimes light and sometimes pounding — that drenched everyone who didn’t cover up with a plastic overcoat — but that didn’t stop race-goers from dressing up — they just wore clear plastic over their clothes. For the owners and the people in the infield, heels came off and the women walked barefoot in the mud. The rain will not deter this crowd. In fact, since its inception in 1875, the Kentucky Derby has never been canceled due to inclement weather — making it the single oldest continuously run sporting event in North America. Miss America was one of the judges of the Longines Prize for Elegance fashion show at Churchill Downs. With all of this excitement going on, we can’t lose sight of the reason we are there; the races. The Kentucky Derby, also lovingly referred to as “The Run for the Roses” because of the huge blanket of 400 red roses sewn together into a blanket and given to the winner, is all about the incredible horses that are born and bred for racing. Throughout the two-days that comprise Derby weekend — which is the largest sporting event in America — nearly two dozen different horse races take place. The culmination is the Kentucky Derby race. 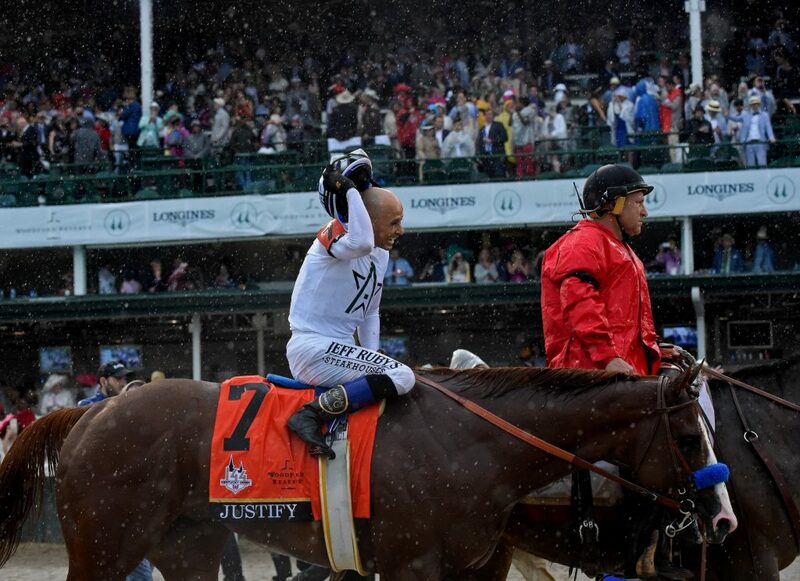 This year, 20 horses entered to win the 144th Kentucky Derby. Thanks to the rain, the dirt track was a muddy track that had thrown off the “easy picks” of earlier races — with some long shots who had a bit of mud racing experience coming in first. However, there were several favorites for the Kentucky Derby and Justify, the winning horse, was one of them. Justify is a three-year-old colt who had not run the Derby at the age of two. He is only the second horse to have won a Kentucky Derby that he did not run when he was two years old. Meaning — he was new to the one-and-a-quarter-mile track. He was ridden by a 52-year-old jockey named Mike Smith and is owned by Kenny Trout — no newcomer to the ponies. Similarly, Justify’s trainer, Bob Baffert is also not new to the races and has trained several winning horses. This year’s Kentucky Derby purse: $2 million. 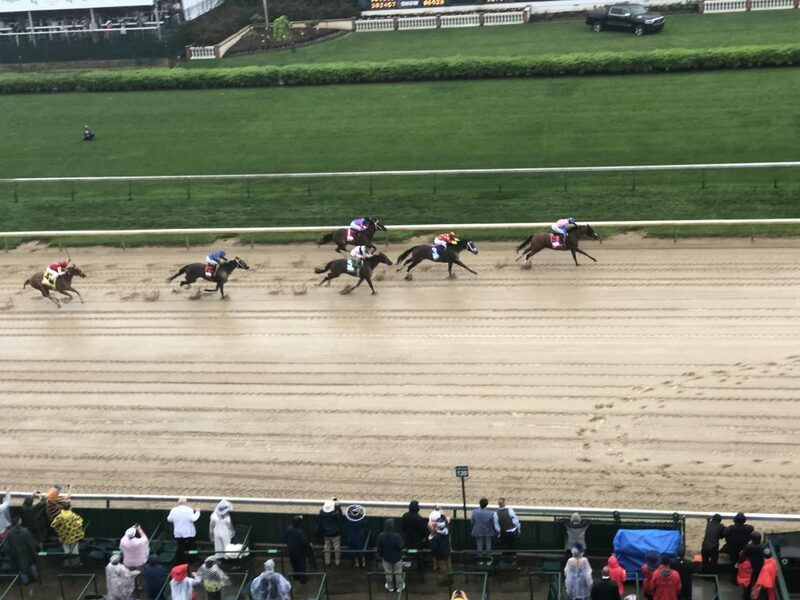 Longines, which timed the race, clocked Justify at the finish line at 2 minutes and 4 and 1/5th seconds. 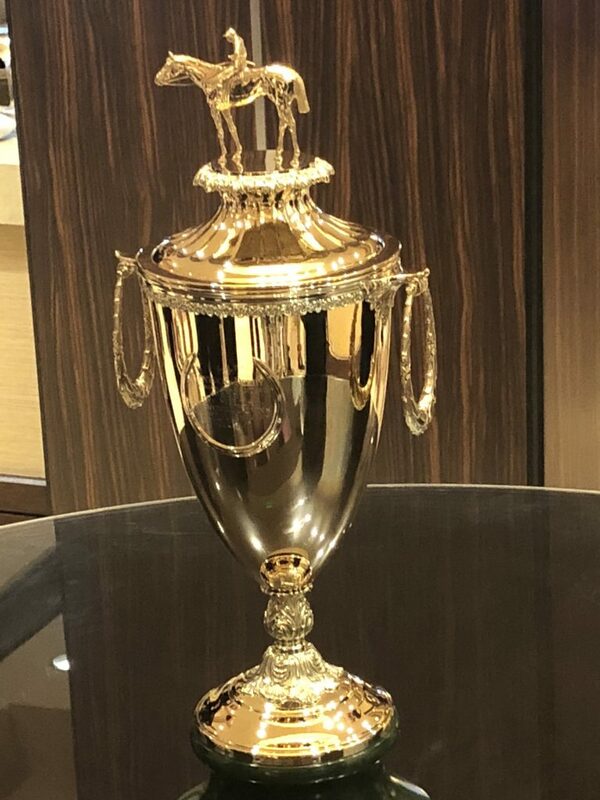 In addition to the aforementioned 40-pound blanket of roses, and the $2 million purse, the owners of Justify also receive the nearly two-foot tall solid gold Kentucky Derby Trophy. Made by a company in New England, the 14-karat gold trophy features an 18-karat gold horse and rider atop it. With a base made of jade, the trophy is said to be worth about $200,000. Additionally, the owners, trainer and jockey all received a Longines Conquest V.H.P watch. It takes nearly 2,000 hours to make the Kentucky Derby solid gold trophy. 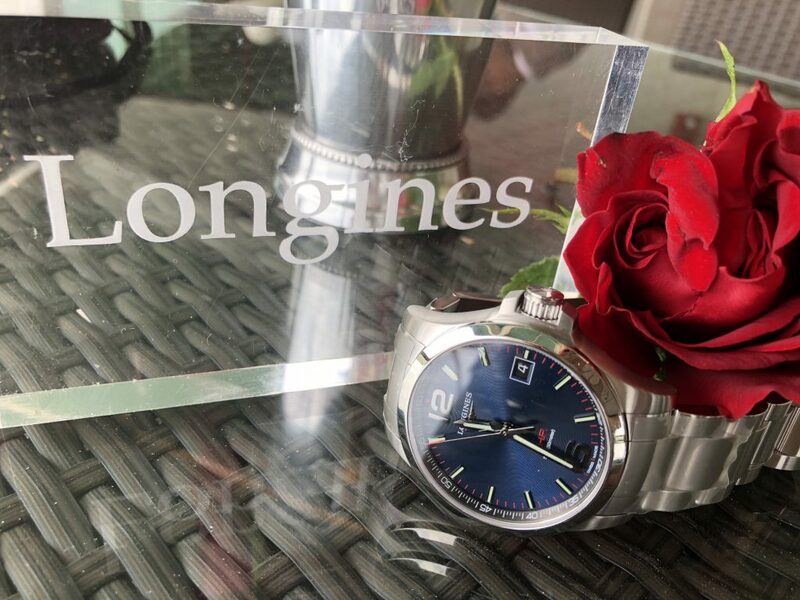 Longines has been the Official Timekeeper of the Kentucky Derby and the Official Watch of the Kentucky Derby since 2011. 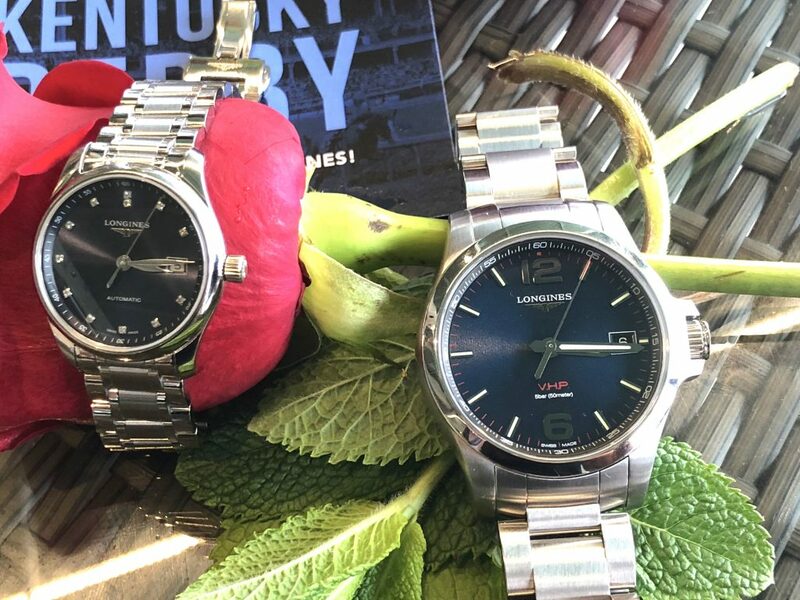 It is also the title sponsor, Official Timekeeper and Official Watch of the Kentucky Oaks race. The brand peppers the Churchill Downs grounds with about a dozen clocks, including a triple-faced clock nearby the Paddocks. A specially made Longines chronometer times each race. 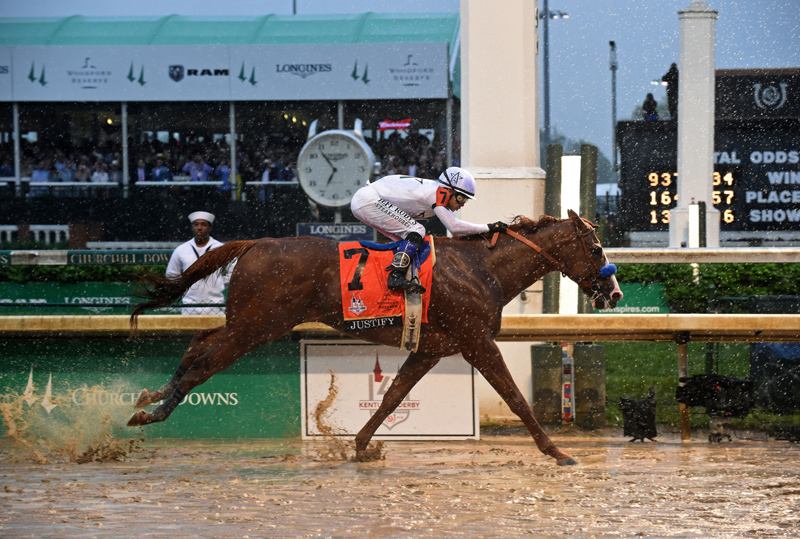 It was a muddy track on the day of the Kentucky Derby 2018, where for the seventh year in a row Longines is the Official Timekeeper and Official Watch. This year, the Official Watch of the Kentucky Derby — the one awarded to the winner — is the Longines Conquest V.H.P. quartz watch with a blue dial and red accents. The 43mm men’s version is crafted in steel and retails for $1,050. There is also a women’s automatic watch that is an Official Watch of the Derby — also crafted in steel with blue dial and diamond markers. I have written extensively about Longines’ involvement in equestrian events on my Forbes.com Perfect Timing column, about the 10 most interesting facts relating to the Kentucky Derby and Longines on TrueFacet, where I am the Executive Editor, and about Longines timing and the Conquest V.H.P. watch that is the Official Watch of the Kentucky Derby on World Tempus. You can visit each of those sites fro details. Here, we opted to bring readers this behind-the-scenes look at the fun, crazy and incredible moments with Longines. 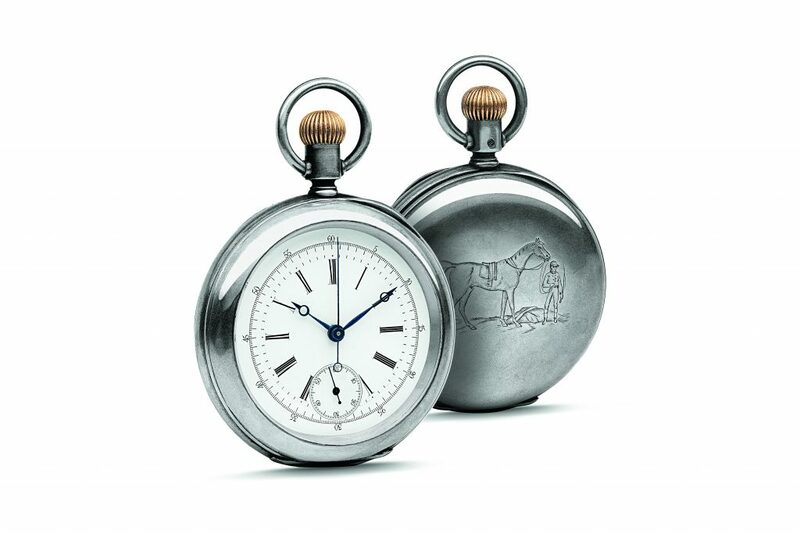 The watch that started the love affair between Longines and the Equestrian world. Made by Longines in 1878. 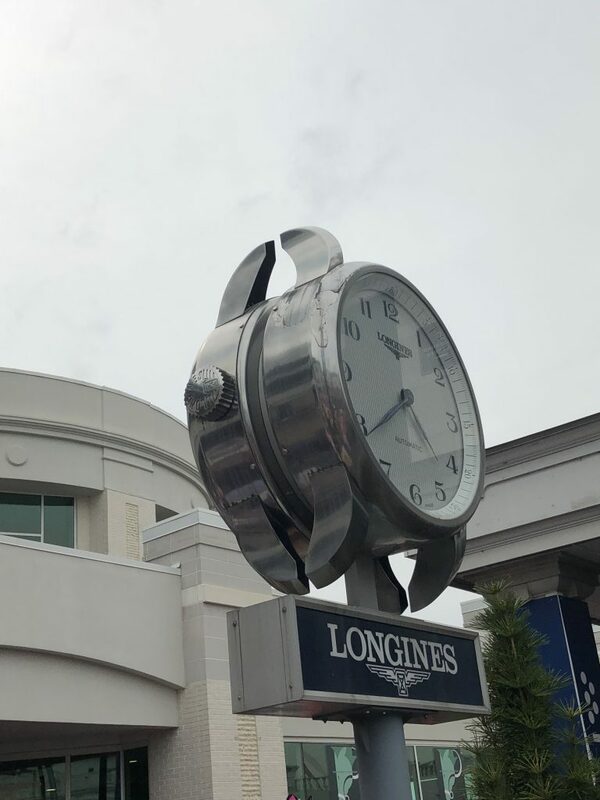 More than a dozen Longines clocks keep time at Churchill Downs.